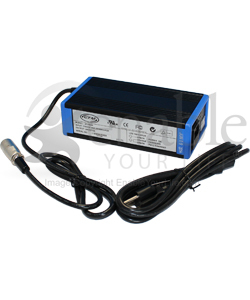 The CTM 5 Amp Wheelchair / Scooter Battery Charger with XLR Connector features a small design and fits a variety of models from Invacare, Pride, Quickie, plus many others. The XLR pin connector is standard on many electric wheelchairs and scooters from Invacare, Quickie, Pride, Merits, Pacesaver, plus many more. You can see a picture of the XLR connector above to verify that your wheelchair or scooter has this. Your wheelchair or scooter must use a 24V system (two batteries) and the batteries must be wet lead acid or gel cell lead acid 20 to 60 Amp Hour. Recommended for Group U1 and Group 22 batteries (Group 24 batteries can be charged but can take longer to get a full charge).